Penny has a lot of thoughts, and she’s encouraged to write them down to keep them from bouncing all around her head. So she starts a blog. It’s a very successful blog, with wide readership and encouraging, loving comments. Penny can connect to these people — but not so much in real life. She’s a klutz, she gets panic attacks, she’s awkward around toxic people in her life. Her only friend is her gay next door neighbor, another outsider who goes to a different school. When Penny’s mother is given a special job in NYC for Christmas, her whole life turns around completely: she meets Noah, a boy who seems to understand her without her explanations. But there are things she doesn’t know about Noah, and discovering these secrets could turn her world — and his — upside down. I watch Zoella’s videos off and on — my brother and I especially love the ones she and her brother do together — and when I saw she wrote a book, I couldn’t wait to read it! There’s been debates out there about a ghost writer doing most of the writing, and whether or not that’s true, I can say without a doubt that this book is entirely in her voice. Reading it felt like listening to her in her videos. And because of that, I fell in love with Penny. Penny is awkward and panicky yet adorable and intelligent. She knows how to connect with people — even if it is through her online portal and anonymity. This is what makes her so sweet and relatable for today’s audience. Her best friend Elliot is wonderful too — and his flawed moments are so genuine and real that their friendship felt modern as well. Best friends are never perfect. Best friends share secret jealousies as well. And best friends always come back together over a good milkshake! While Noah was amazing as well — so very kind and considerate with Penny — I focused so much more on the pacing of the novel. I was relieved to see that the “whisking the family to NYC” bit was about 100 pages in rather than right away. This allowed for a solid understanding of who Penny is, the dynamics with her family, with Elliot, with Elliot and the family, and between Penny and her school friends. We get a proper peek into her life before it’s turned around completely on the family trip. Even when Penny comes home from the magical NYC holiday vacation, nothing feels rushed. in the world — or you can make it something that takes away. ask yourself: is this going to add to the happiness in the world? There were a few small, quirky Britishisms and Americanisms scattered around. The voice was fun and sweet, and very young teenager. This is perfect for someone just getting into YA fiction — and if you’re in for a holiday read! Give this to another digital-type friend — they’ll probably really relate to this too! 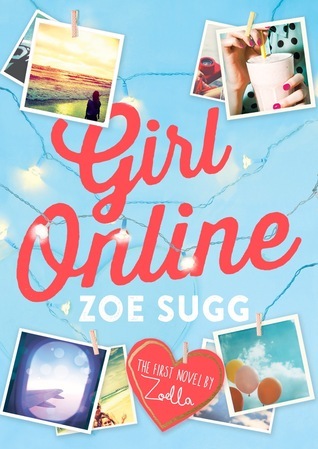 I love Zoe and I’ve been meaning to read this when I learned that she published her book. But, then when I found out that it was ghost written bothered me. But, what annoyed me the most was that she didn’t make any reference of it etc. Despite that fact, I’m still going to give it a go sometime. Some say that it’s kinda her bio is this true? Whether or not it was ghost written, it definitely sounds like her. So either good on her for writing the book or good on the ghost writer for capturing her voice. As to this being her bio, I wouldn’t know. I don’t care one way or another. It was an enjoyable read, and that’s what I liked. You should give it a shot! You might like it too.